This is a post about crisis pregnancy that is aimed mainly at those in a position to support an unborn baby and its family. If you are facing an unplanned pregnancy yourself, you may prefer to read this accompanying post dealing directly with such a situation. In the United States it’s a polarised political issue. Abortion clinics have permanent protesters stationed outside, and every politician must express a party-appropriate opinion, loudly and often. In New Zealand it’s hardly an issue at all. Between readily accessible abortion and the welfare safety net single mothers can land in, if you’re not pregnant, you can kid yourself that crisis pregnancies have nothing to do with you. In both countries, abortion occurs at a relatively high rate in the population. Germany, of all places, has travelled a third path that I find pretty inspiring. Abortion is readily available but occurs at a third of the US rate and a quarter of the NZ rate. Why? Hillary Clinton’s position on abortion, when she was campaigning to be the Democrat candidate for President, was that it should be ‘safe, legal and rare.’ I think many would agree with that trio, and Germany has something to teach us if we aspire to making the third one a reality. Pro-life or pro-choice, believers in the idea of the ‘imago dei’ or not, no one thinks that abortion is awesome and should happen often. This is really a post about that third word: rare. Let me tell you the German story. Around the same time that the Supreme Court of the United States decided, in Roe v Wade, that the state could not invade a woman’s personal space and compel her to continue a pregnancy she didn’t want, and that a foetus was not a person whose right to life could trump a mother’s right to have her body in her control, Germany was doing something quite different. When the question of legalising abortion came before the highest court in West Germany, as it then was, the court decided, given Germany’s recent history of guns and concentration camps, that the right to life must be paramount, second to nothing. And so they gave legal protection to unborn babies. But then they went further. After reunification, the parliament had to reconcile two very different approaches to abortion law, and their first attempt was challenged in the courts again. At this point, in the early 1990s, the court decided that the state not only had the responsibility to limit abortions legally, it had the responsibility to make sure no woman ever felt like abortion was the only option. And so the court required the government to look at every aspect of German life and make Germany an hospitable country for unborn babies. For instance, Germany is very densely populated. The court noted that where housing was in short supply, and tenancy agreements had a maximum number of occupants, some families were choosing abortion so they wouldn’t be kicked out of their apartments for having more people in the house than the tenancy agreement allowed. So the parliament changed tenancy law to stop that happening. I argued on Sunday morning that people who feel strongly about protecting the unborn – whether for religious or other reasons – need to put their money, time, love and support where their mouths are. We must build a culture of hospitality so that no woman feels she needs to have an abortion because she is alone or unsupported. These are, of course, murky waters, and I am not going to argue further about the legal position here, but about what Jesus calls his followers to be: neighbours to anyone in need. You might remember the famous story he told about the man in distress who was helped by the most unlikely stranger, the ‘good Samaritan.’ You can watch a stop-motion animation of it, if that’s your kind of thing, or just read the story below. 30-32 Jesus answered by telling a story. “There was once a man travelling from Jerusalem to Jericho. On the way he was attacked by robbers. They took his clothes, beat him up, and went off leaving him half-dead. Luckily, a priest was on his way down the same road, but when he saw him he angled across to the other side. Then a Levite religious man showed up; he also avoided the injured man. An unborn child, vulnerable and dependent, is our neighbour. So are its parents. 31 ‘When the Son of Man comes in his glory, and all the angels with him, he will sit on his glorious throne. 32 All the nations will be gathered before him, and he will separate the people one from another as a shepherd separates the sheep from the goats. 33 He will put the sheep on his right and the goats on his left. Our holy writings tell us that helping a stranger is a sacred task that God takes very seriously. In welcoming, feeding, looking after ‘the least of these’ we are, in a very real sense, welcoming, feeding, looking after Jesus Christ. This is one reason the church has always seen the care of unwanted children as core business. We in the local church today need to get back to that business. As I said in my sermon, ancient Israel was distinctive among its neighbours for not killing unwanted newborns. Infanticide has been common practice across cultures and history, but Israel and the early church were noted exceptions. Christians were so notorious for their weird attitude of respect for babies’ lives that all sorts of people in Roman times started leaving their newborns at Christians’ doorsteps instead of killing them. Very early on, the church began and became known for systemic care of the needy. God’s people have always extended this respect of life to the unborn, making them even weirder. We see some evidence of how the Jewish people thought about things in Psalm 139, where the poet praises God for having ‘knit me together in my mother’s womb.’ And in Luke 1, an unborn baby, the future John the Baptist, is an actor in the drama of Scripture, before he’s even born. I promised on Sunday morning that there would be some specific ideas here about how we can each take part in making our community hospitable to unborn children. So here’s a list, and I’d love you to add to it. Some things are huge (eg, foster a child!) and some are not, but they’re all part of building an hospitable community where far fewer than the current 17,000 women a year will feel that abortion is their only option. If taking in a single mum is too much of a stretch for you, how about strategically supporting someone who can do that? Check out the House of Grace if you’re in Wellington. It’s a home for pregnant teenagers who need support, and there are lots of ways, big and small, you can help their work with these young women and their babies. If you’re elsewhere, Heartbeat International has a worldwide directory of such places, and any one of them would welcome your practical or financial support, I’m sure. You could also just google your location and ‘crisis pregnancy support.’ If you know personally of a good place, pop a link in the comments below. Helping a pregnant woman is just the start, of course. Birthright is dedicated to supporting single parents. See if you have skills or time they would appreciate. Do you have a spare room? Could you offer it to a single mum and her baby? A church, fostering agency or state or council department with responsibility for the care of children may be able to match your household with someone who needs a supportive living arrangement. Talk it over with someone. Do you have practical skills you can share? If you have a couple of hours a week you can give to teach a young parent how to budget, cook, garden, sew, fix a car or something else, you could make a huge difference to a family. Or maybe you could use those couple of hours to do some chores around their house that are a stretch for a family with a small child – especially for a single parent. Offer to mow their lawns regularly, or clear out the guttering, clean the oven or wash the car. Is there a single mum living on your street who might appreciate a bit of help? Tell a neighbour who is a single parent (or vulnerable in any other way) that they are welcome to call you in the middle of the night if they need another adult around. Give them all your phone numbers and a smile. Any of the tips from this post will apply to supporting someone with a crisis pregnancy or with a newborn and not much support. There’s also this great list of 50 ways to help a single mother, most of which would apply to most of us. Have a read! Equip yourself for the next level of radical hospitality. With a bit of extra training or support, could you mentor a young parent? Could you offer respite care (the odd weekend) for a child or young mother? Could you consider full-time fostering of a little person who needs a home? Do you want to be the house-parent of the next House of Grace? Let God guide your imagination, and provide the courage. Speak to someone this week about what you would need to do next to take on a challenge. Open Home and its mentoring initiative Fresh Perspective could provide some training and a place to connect with someone in need. Child, Youth and Family coordinates fostering in New Zealand (Open Home contracts from them) and provides training and financial support. Check them out. Mick and Ruby Duncan run Alongsiders seminars to equip and motivate ordinary people to come alongside complex, vulnerable people. Watch their promo video below (with the story of Becs and Dorothy I mentioned today) and consider doing a seminar with them or watching the video with a bunch of friends. What else? Do have advice or ideas to offer? Add a comment below with your wisdom, please! 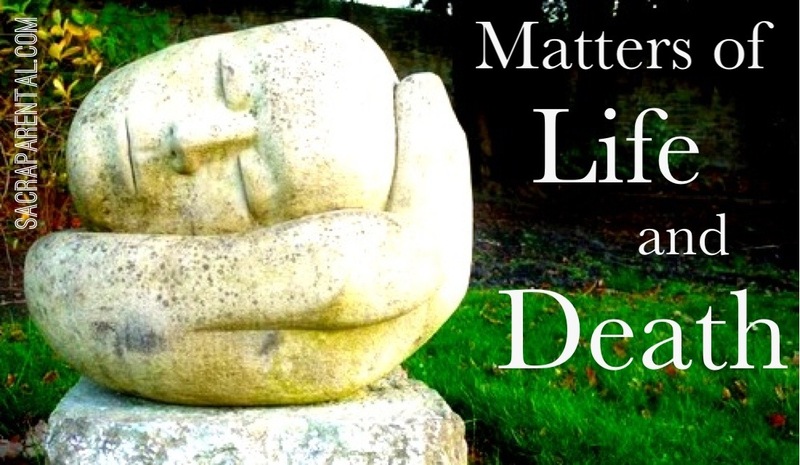 I am heavily indebted, for this post and the sermon it accompanies, to the work of Prof John Wyatt, particularly in his excellent book, Matters of Life and Death. Order a copy right now if a Christian approach to these issues interest you. And the last word today goes to Elaine Storkey, who wrote these beautiful words about the hospitality a mother shows to a foetus. May we all choose to build a world where women are enabled to offer this costly hospitality. Pregnancy is itself a symbol of deep hospitality. It is the giving of one’s body to the life of another. It is a sharing of all that we have, our cell structure, our bloodstream, our food, our oxygen. It is saying ‘welcome’ with every breath and every heartbeat. And for many mothers that welcome is given irrespective of the demands made on one’s own comfort, health, or ease of life. For the demands of this hospitality are greater than almost any of our own. And the growing foetus is made to know that here is love, here are warm lodgings, here is a place of safety. In hiding and in quiet the miraculous growth can take place. This is part of a series on Christian bioethics that accompanies my sermons at Wellington South Baptist Church. Anyone is welcome to join the conversation. If you want to catch up, you can read the introductory post, Being Human, and see the series list here. If you are facing an unplanned pregnancy yourself, I have written this accompanying post that you may wish to read. If this is your first time visiting, do feel free to check out the Welcome page for a little tour of what the blog is all about, and shortcuts to some key posts and series. And welcome! There are plenty of ways to join the Sacraparental conversation and keep in the loop. You can follow me on Facebook (for extra links and resources, daily), Pinterest (for link-plantations) and Twitter (for occasional ranting and raving). The sculpture in the cover image is called Head Hand Seedling, by Daniel Clahane, and is in Saltwell Park, Gateshead. The original photograph is by Andrew Curtis. I commend you on your courage in addressing this issue from the pulpit. In the last 25 years, 376,738 infant New Zealanders have been murdered/terminated/killed in utero (Source: Statistics New Zealand) and I’m pretty sure this is the first time I’ve even heard a sermon on the subject – and I’ve been in evangelical churches for 24 of those years. Hard to believe that would have been the case if the state were authorising/funding (or even just indifferent to) the killing of that many New Zealanders who were not in their mother’s womb. The German example is interesting – thank goodness perhaps for slightly differently worded constitutions, and the different personal biases of the judges in the respective countries (as everyone recognises, different judges in the US would decide the matter differently). But does it tell us anything about what makes the abortion rates across the two countries so different? It probably isn’t the role of the church as agent of hospitality, in fairly secular Germany. I think your point about hospitality and care is well made. And that point stands regardless. But it is pretty disconcerting to hear a Baptist minister using the pulpit to, apparently, endorse the legality of abortion. We don’t argue that murder should be legal, while urging that we complement such legalisation with the creation of a society in which no one feels sufficiently alienated or otherwise impelled/compelled to murder – even though we recognise that in very rare cases, self-defence might make a killing regrettable but defensible. Hospitality might make a marginal difference to the abortion rate, but it is difficult to believe that it will transform the abortion record in secular New Zealand. For many, there is simply nothing wrong with abortion – and studies are pretty mixed on whether there are long-term adverse psychological effects on those who have had, or helped facilitate, abortions. You might respond that as Christians we can be hospitable, but we can’t change the law. But we are voters in a democracy – and unlike Germany or the US a democracy without a constitution to thwart the expressed will of Parliament. The well-documented indifference of US Baptists on abortion in the 60s and 70s – in contrast to the Catholics – helped open the way to mass legalisation of abortion in New Zealand. Many Christians excuse the apparent indifference with a “but it is just one issue”. And in one sense it is, but it is one over which 376,738 NZers (“the least of these my brethren”? )have paid with their lives. Few other issues politicians face seem quite that momentous. Thanks for these serious comments, well made. Just to be clear, I don’t think I have argued, from the pulpit or the blog, that I believe abortion should be legal. Whether something is wrong and whether it should be illegal are two distinct but overlapping questions (I think gossip, adultery and greed are wrong, but in my spare time I’m not drafting legislation to outlaw them). As such I have chosen in both the sermon and the blog to leave those questions aside entirely, and focus instead on another way the church can make a significant difference. I have done so for three reasons: 1) the question of the role of Christians in a democracy is a huge one, and can’t be sensibly dealt with in half a sermon, 2) those questions are well traversed elsewhere, while our responsibility of hospitality is not, and 3) a focus on hospitality is a focus on common ground, which is something the US-style polemic debates miss out on entirely. The blog readership, and perhaps to a lesser extent the church congregation, is broad and diverse, and would certainly include both pro-choice and pro-life voices, but I think most of us can agree that fewer women feeling compelled to seek abortion is a good thing. I agree with you that we should take our democratic power seriously – we are in absolute agreement about that. I certainly wouldn’t respond as you suggest, and say we can’t change the law. In fact, the law as it stands is not being applied as intended, and is being legally challenged by a group of doctors right now – but again, this is another question, and quite deliberately outside the scope of what I wanted to spend time on this week. With respect to Germany, no, you’re probably right that the church is not responsible for the dramatic difference in abortion rates. It is the government, there, that has assumed the role of hospitality-provider. In the absence of a NZ government thinking the same way, I suggest that (as well as considering how we vote and what we lobby for) we as the church have a gospel-centred responsibility to step into that gap. There is a definite difference in how German people think of abortion, in my observation, and I believe the two things go together – the attitude and the level of practical support available to those with an unplanned pregnancy. We have several regular readers who live in Germany – I’d love to hear an up-to-date perspective from the ground there! I would encourage you to rethink your scepticism about what hospitality can achieve. Perhaps you might know someone whose life has been changed by being welcomed and supported in difficult circumstances? I certainly know many. You may not have explicitly argued in the blog that abortion should be legal, but when someone invokes Bill Clinton’s 1990s formula (“safe, legal and rare”), and goes on to observe that “I think many people would agree with that trio”, while not personally disavowing personal agreement, it is a pretty clear implicit message. If you don’t think abortion should be legal, why not say so? And, of course, I agree that not everything that is sinful should, or can, be criminalised (although there are still several US states where adultery remains a criminal act). But abortion is not just any act – recall the 376000 dead New Zealanders. Perhaps one parallel might be with slavery. Presumably no one thinks it should be “safe, legal, and rare”; we just think it is wrong, and appropriately outlawed (notwithstanding Old Testament provisions that might fit with something like a “safe, legal, and rare” framework. Church leaders who defended laws allowing slavery in the US South, even if they personally sought to minister to those who were oppressed and encourage slaveowners to treat slaves humanely, brought shame on the Christian church. I wouldn’t downplay the importance of hospitality or the ability to change, and transform, individual lives. I’ve seen the difference it can make. And every single life saved counts. But across a whole society I doubt the difference it can make, unless it leads to a widespread revival of the faith across the country, and a transformation of sexual mores, attitudes to life etc etc. We pray for that, indeed long for it, but can’t count on it.Laws matter too. Michael, I care so much about the 376,000 that I am working hard to motivate a workforce of carers to make a significant difference, whether the law is changed or not. It may be a small contribution but it’s a real one and I am sincere in thinking it can be significant. That is what this blog post about. It isn’t a general post on all aspects of abortion, and I deliberately remained vague about my own opinion on the law (you have put words in my mouth but they aren’t ones that belong there) in order to remain focused on this question of hospitality, which, as I say, is one that I believe is neglected. Thanks for the interaction, though! Keep it coming! I am living in Germany so if anyone has any specific questions about it I would be happy to answer. Just a quick comment though before I head off to work.. I think that the low abortion rate in Germany is strongly related to the amazing health care system. I have never had to pull out my wallet for a doctors visit or prescription, and my daughter will be automatically insured until she finishes studying and enters the workforce! In addition, university education is practically free here. Thanks, Dreamwife! I’d love to hear more. What’s your impression of how German people think of abortion? Are you in the former West or East? The Babyklappe is a complicated question, I think. Being left for strangers to raise is better than dying, for sure, but even better is enabling a woman to care for her own baby if at all possible. I’d be keen to see some evaluations of how the baby hatches influence women’s decisions. You clearly believe that the issues around the legal position are more complex. That itself is an arguable proposition. I suspect, and hope, that one day Baptists will hang their heads in shame at the indifference to the slaughter of the innocents. Laurie Guy’s book is a good reminder that the last Assembly resolution on the subject, decades ago, was for a model much like current nz legislation (tho of course, and as you note, that legislation is abused). It is probably unfortunate – all round – to have a visiting preacher tackling what is, sadly, a controversial issue among Protestants, in the absence of the pastor. I’ll continue to bring the discussion back to hospitality, because it’s not an either/or proposition. If we focus all our energies on changing the legal position, and it does, then next year 17,000 more not-particularly-wanted-by-their-mothers babies will be born and the need for the church to welcome and care for these children and their parents will be just the same as what I’m proposing. Whatever our strategies on the legality of abortion, we do need to have this present conversation on how to look after babies born in difficult circumstances. I’m closing discussion on the legal question now. I think we’ve gone over that ground enough and I’d like to make space for more discussion on how an approach of hospitality can make a difference, particularly if people have practical suggestions or stories from their experience to share. Great blog post Thalia. And especially the accompanying one on those who have had or been involved with abortions and the consequences. I had not previously come across this specific concept (hospitality towards those not yet born) and have found it very helpful. The fallout from this attitude is that the next step, which is certainly currently being debated in medical, academic and legislative circles, is to align the law with current practice, namely abortion on demand. The reason that this step will eventually be forced is that it is now fairly well accepted, even by proponents of abortion, that on average the mental health of women does suffer more if women have an abortion than if the don’t. A clinician can no longer use the stock line that a woman is likely to suffer more mentally if she continues the pregnancy. This will at least frame the question back where it started – a woman’s autonomy vs the baby’s right to life (not a woman’s “well being” vs the baby’s right or life.) The problem is that the foetus now has so little value in our society that the former will almost certainly trump the latter. As a father of five, (2 miscarriages, 1 stillborn, 1 active little 3 yr old boy and another boy almost here) this saddens me beyond measure. When my son Dominic was born sleeping at 25 weeks gestation I came across a statement made towards people who were struggling with infertility. It said that a child, whether unborn or not even conceived, is real to the parents to the degree that they are loved. I initially viewed this in a positive light, of course Dominic was real to me and it helped me empathise with people struggling at any step on the path of parenthood. I hit a stumbling block though when I started thinking of this in the context of my patients who had had or were having abortions. Were those children not real because they were not loved? Is the value of life dependent on the receipt of love? The epiphany that this lead to, which may seem obvious to the theologically inclined, is that everyone, born and unborn, yearned for or rejected, acknowledged or unknown is loved by God to a degree that we cannot even comprehend. I am sorry for getting quite off topic here, and indeed revisiting the legality question. I agree that a focus on hospitality is key to engaging with the issues, acknowledging the personhood of the foetus and providing practical support to the mother. I particularly like the German position of using the starting point of a foetus being a human being and building the whole law around this proposition. I do think that we can’t disengage the legislative issue however, especially in the light of current developments in New Zealand. Our hospitality should extend to both mother and child in a way that our society refuses, stepping into the gap and being Christ to the world. The question in my mind is this, if abortion was made illegal tomorrow, what would we as a society do to help women with crisis pregnancies? This issue will not go away, no matter what the law is, and my concern is that if abortion was made illegal, one of the results would be the proliferation of back street abortionists once more. These were (and still are, in some countries), horrendous places. Procedures were performed in dirty, unsanitary conditions, by practitioners who were not adequately trained. Sometimes the women were beaten or abused, or had their money stolen from them. Some suffered from haemorrhage, infections, or internal injuires. Some actually lost their lives. No woman should have to resort to such measures. Let me be clear here, I am pro-life. And I’m aware that abortion procedures, as they are performed today, are hardly free from adverse side effects – but the likelihood of these happening has been considerably reduced. I believe that abortion hurts women, and ends lives. But in joining this discussion, I am trying to advocate from a practical viewpoint. If we are to tell a woman who is experiencing a crisis pregnancy that the life she is carrying is important, then what are we going to do to walk our talk, and ensure that she and her baby are supported, and cared for? I think that is the important question, which Thalia has raised in writing about hospitality. We can debate ethics, morals, and laws all day long, and there are some excellent points raised in the replies here, but lets talk reality here for a minute. Our society is not kind to single mothers. There is such a stigma attached to their position, we all know what the stereotypes are. And they are far from living in the lap of luxury. What can we do to help?